In cooperation with the Simon Fraser University, this $65M project aims to redefine and enrich the student experience at SFU. Student Union Building Size: 100,000 square feet. Student Union Building Location: South of Freedom Square between the Maggie Benston Centre and the AQ. Stadium Capacity: Estimated 2,500 seats. Stadium Location: Stadium will be built at the Terry Fox field. 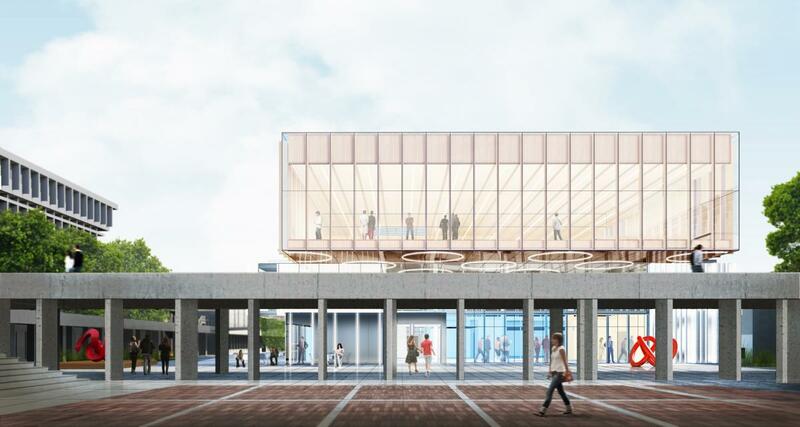 Funding: Undergraduate students have voted to support the Build SFU project. The project is funded by an undergraduate student levy effective January 1, 2014. The Build SFU project is the SFSS’ response to 6 years of consistent student requests for improvements to facilities and student life. The student union building and stadium will provide new space that will enhance the sense of community and the student experience at SFU. Download a copy of summary here. 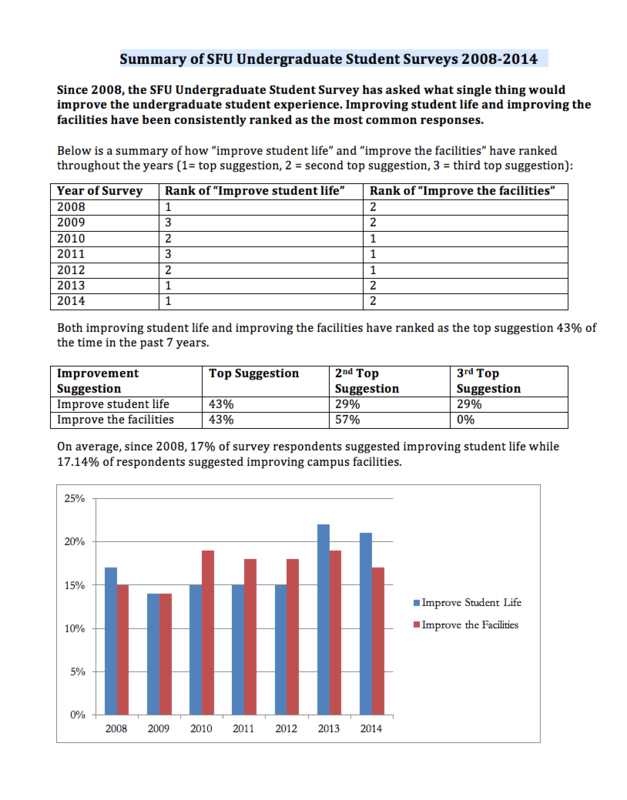 Review the SFU Undergraduate Student Annual Survey results. The cost of design and building of the Student Union Building (SUB) and Stadium is estimated at $65 million. The majority of the cost is related to the SUB design and construction. The SUB offers 100,000 square feet of student activity and study space, and some much needed facilities, including bicycle storage and showers, multi-purpose room, rehearsal room, expanded dining space, meeting and presentation rooms, gaming room, storage, workshop space, lounge space, social stage space, and more. Learn about what the SUB offers here. Learn about the Stadium here. How much are students paying? Students are currently paying $60 per semester. Funds are collected through an undergraduate student fee called the Build SFU Levy. The Build SFU Levy was approved by the student referendum in Spring 2012, and collection began in January 2014 at $10 per semester. While the levy is currently at $60 per semester, by 2022, it will gradually increase to $90 per semester. In 2023 and following years, the levy will be adjusted annually for inflation according to the Canadian Consumer Price Index (CPI). The levy is designed for students participating in the design process to pay less than those who will be able to use the new facilities. What about students in financial need? A Build SFU Bursary is available to students in financial need. The bursary is administered by SFU Financial Aid and Awards. Students enrolled in 3 or fewer units pay half of the levy amount. The Simon Fraser Student Society (SFSS) expects SUB construction to wrap up in late March 2019 and expects the building to open to students in Summer 2019. SFU and the contractor believe the building will be complete in late March 2019. It will then take about a month to move furniture and people in and get the building ready for students to use. The SFSS is planning to host a grand opening in Summer 2019. Pro-Can Construction Group is the contractor and is responsible for building the SUB. Pro-Can sets the construction schedule. SFU is managing the contractor and the consultants (e.g. the architects and engineers) on behalf of the SFSS. The SFSS is not involved in managing the construction work. Instead, the SFSS relies on SFU and the contractor to manage the project and the construction until the building is ready for move-in. The SFSS ensures the project’s financing proceeds as planned and makes adjustments as needed. Additionally, the SFSS is working on final design elements for the building, including furniture selection and the design of wayfinding and signage. Earlier in the project, the SFSS ensured students were involved in the consultation process for site selection, space programming, and building design. The excavation took longer than planned because the soils were not what was expected based on test drilling that had been done prior to the start of construction. Two winters with heavy snowfall, especially December 2016, slowed down concrete pouring and underground work. The construction crews have been unable to make up this lost time. The construction market in Metro Vancouver is very busy and, in many areas, there are more jobs than workers, slowing down the pace of construction. The building’s design is complex as compared to a typical office or condo building; therefore, many questions have come up between the contractor and consultants which has caused some delays. Some components of the building are being manufactured overseas and could not be ordered until other design details were worked out. They will take months to be delivered and then installed and the building cannot be completed without these components. The SFSS is not willing to compromise quality of construction in order to open the building sooner. The building needs to last for many generations of students and it needs to be well built. What is being done about the delay? The contractor and consultants have implemented new processes to ensure that decisions are made more quickly on site. The SFSS regularly meets with SFU (who is managing the construction) in order to see what action they are taking to reduce the delay. The SFSS has met with the contractor to see if they have suggestions for ways to speed up construction. This resulted in a productive meeting between SFU, the contractor, and the consultants where new processes were developed to speed up construction. The SFSS provided additional funding to the architects so that they would spend more time on site than usual. This has helped speed up the question-and-answer process between the contractor and the design team. The project would otherwise be even further behind schedule. This funding is within the project budget. Funding has been reallocated, again within the budget, for other consultants to spend more time on site in order to answer questions quickly and reduce waiting time. The project is on budget. The Women’s Centre, OOC and FNSA will remain in their current homes in the Rotunda until the SUB opens. The SFSS is looking for student artwork for the SUB – stay tuned for more information on how you can display your art.